Upon our recent trip to checkout the new skate park and grassy "amphitheater" at Grant Park, just north of Roosevelt, we noticed a placard that is either new or we've never noticed before (see image on the right). 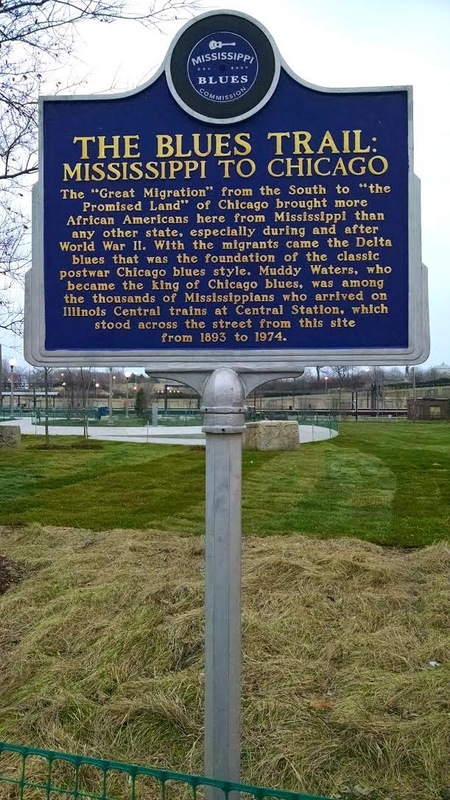 The “Great Migration” from the South to “the Promised Land” of Chicago brought more African Americans here from Mississippi than any other state, especially during and after World War II. With the migrants came the Delta blues that was the foundation of the classic postwar Chicago blues style. Muddy Waters, who became the king of Chicago blues, was among the thousands of Mississippians who arrived on Illinois Central trains at Central Station, which stood across the street from this site from 1893 to 1974. Robert Johnson never moved to the place he praised in his song "Sweet Home Chicago," but his sentiments were shared by thousands of fellow Mississippi natives who came here in search of a better life. In "Chicago Bound," bluesman Jimmy Rogers called the city "the greatest place around," and in "Chicago Blues," Arthur "Big Boy" Crudup deemed it "the greatest place on earth." Many migrants traveled north on the Illinois Central (IC) via its extensive lines that spread across the Deep South, including eight hundred miles of IC-owned Yazoo & Mississippi Valley Railroad track that criss-crossed the Mississippi Delta. Pullman porters on IC trains to Mississippi often delivered copies of the African-American newspaper, the Chicago Defender, which organized "migrant clubs" and arranged group discounts for train fare northward. The first wave of the "Great Migration" began with World War I, and between 1910 and 1920 the number of black Chicagoans who were born in Mississippi increased from 4,612 to 19,485. The rise of the blues recording industry in Chicago attracted many musicians, and during the 1930s, blues artists here who claimed Mississippi roots included Willie Dixon, Memphis Minnie, Lil Green, and big Bill Broonzy. During World War II the need for factory labor helped fuel a larger wave of migration, and between 1940 and 1950 some 150,000 Mississippians moved here. Muddy Waters, Howlin' Wolf, Bo Diddley, Jimmy Reed, Sunnyland Slim, Emore James, Sonny Boy Williamson, No. 2 (Rice Miller), Otis Rush, and Magic Sam were among the many who arrived in the 1940s and '50s and found recording opportunities with Chess, Vee-Jay (co-founded by Mississippi native Vivian Carter), Cobra, and other labels. Blues clubs proliferated on the South and West sides, and Chicago's airwaves also took on a down-home Mississippi flavor on programs hosted by Pervis Spann of WVON and Al Benson of WGES, who earned the honorary title "Mayor of Bronzeville" as the South Side's most popular personality. Local labels Delmark and Testament began recording blues albums in chicago for a new generation of listeners in the 1960s, paving the way for other companies such as Alligator and Earwig. Albums by Mississippi-born bluesmen Big Joe Williams, Jimmy Dawkins, Carey Bell, Honeyboy Edwards, Big Walter Horton, Eddy Clearwater, Eddie Shaw, Magic Slim, Fenton Robinson, Eddie C. Campbell, and Hound Dog Taylor brought their music to world-wide attention. Foreign tourists made Chicago a musical destination, and the local blues audience adopted "Sweet Home Chicago" as its theme song as the blues expanded to the North Side, the suburbs and here to Grant Park, where the world-renowned Chicago Blues Festival debuted in 1984.